My Diva Diet was developed by Christine Lakatos who is a former professional bodybuilder and certified fitness trainer. Her program is designed specifically for women and she promises readers that it will be the last diet book they will ever need. Lakatos has drawn on her experience in competitive bodybuilding and incorporated the concepts that allowed her to reach a body fat level of 6% without resorting to starvation diets or drugs. She uses animated diet villains and fitness superheroes to illustrate important information in a format that is fun and easy to understand. Lakatos states that her program is based on changing your lifestyle so that you will not only lose body fat and improve your health but also will be able to easily maintain the results that you work so hard to achieve. In My Diva Diet Lakatos presents a detailed weight loss system in an interactive workbook format that includes quizzes, checklists, recipes, advice, and tips. She outlines the five major factors she believes are responsible for weight gain and explains how each factor can disrupt your attempts to lose weight. Practical solutions are provided that will help you avoid common dietary mistakes related to the five factors. The basic structure of the diet is similar to the Zone and South Beach diets and includes small frequent meals that contain a balance of protein and low glycemic index carbohydrates. Clean eating is emphasized which involves eliminating all processed foods and instead choosing more natural and organic foods. The first phase is called the Diva Reduction Phase and is based on a calorie intake of 1200-1300 per day. The daily nutrient ratio on this phase is 35% protein, 45% carbs, 20% fat. This part of the program is followed for three to ten weeks. Desserts should be avoided in this phase. The second phase is the Diva Maintenance phase, which allows 1400-1600 calories daily. Daily nutrient ratios for maintenance are 20-35% protein, 45-65% carbs and 20-30% fat. On both phases the calorie intake may be adjusted higher for women who are very physically active. After the first two weeks on the Diva Reduction Phase, cheating is permitted once a week. A cheat sheet is provided which includes a list of acceptable foods and serving sizes. In the maintenance program you should still limit your cheat to once a week but you are now allowed to deviate from the program once or twice per month. Fresh fruit, vegetables, low fat yogurt, low fat cottage cheese, lean meat and poultry, fish, eggs, legumes, tofu, soy milk, whole grains, raw nuts and seeds, figs, raisins, dates, prunes, agave nectar, honey, olive oil, salsa, mustard, low fat mayonnaise. Exercise is an important part of the program. An effective exercise program should include cardiovascular conditioning, strength and endurance training, flexibility, core, and balance training, corrective exercises, and functional training. Based on up to date scientific principles. Specifically meets the needs and goals of women. Focus is on a long-term solution rather than a quick fix approach. Illustrated format can help to maintain attention and highlight important points. Flexible approach with seven different ways to use the program. High intake of protein prevents muscle loss while dieting and reduces appetite. Provides clearly illustrated guides to portion control for many common foods. Includes a menu plan and recipes. Author has over 25 years experience and is a living example of what she teaches. Fairly strict and requires elimination of many foods. May be somewhat difficult to eat out as many common ingredients are forbidden. Recommends the intake of oils that are very high in omega 6 fats, which could potentially exacerbate an omega 3 fatty acid deficiency or imbalance. 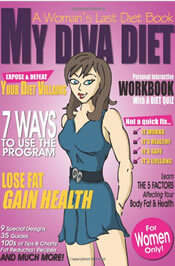 My Diva Diet presents a lot of useful dietary information in a format that will be easy for most readers to absorb. Her program involves a clear system that is based on solid principles and is likely to produce successful results for most dieters.